Cape Town - In an exclusive interview, BRODIE RETALLICK talks about the Chiefs’ underwhelming start to the season, why the Springboks are a force to be reckoned with and previews the Bulls duel on Saturday. Sport24 asked: How would you assess a winless start to the season? Brodie Retallick: It has been very challenging and it obviously affects you as an individual and a team. (The Chiefs have lost four and drawn one of their first five matches this Super Rugby season). We have suffered some big losses in the early stages of the competition and we are finding our feet in terms of what we are doing on the field. If you look at our squad on paper, we have got some very young players, many of whom are in their first season of Super Rugby. They are highly talented, but don’t have too much Super Rugby experience. It’s been about bringing them up to speed as far as what is required in such a challenging competition, which then allows them go out and play with the talent that they have. I’m not sure where it (the rumours of alleged tension between the players and the coaches has come from). When a team is not winning, you are under increased pressure and scrutiny, but we are all on board. The coaches are getting across to the players and the important thing is that we are all on the same page. We have a quality group that should probably be playing better than it is. We didn’t manage to get the victory against the Hurricanes last weekend, but I feel like a win is not too far way. Especially over the last two to three weeks, we have been working hard at achieving a positive outcome and some of the good stuff is now starting to show out on the field. Sport24 asked: How have you adapted to captaining your franchise? Brodie Retallick: In the first two or three weeks, the captaincy was tough for me and has been a little bit of a challenge. It’s about getting the balance right in terms of worrying about the team and then, at the back end of the week, just being concerned about yourself and being able to play the best you can. In terms of my performance, I have been getting there over the last couple of weeks. If I concentrate on my own game and get the balance right then hopefully I can produce some good footie on the field. The captaincy has been a learning curve. It’s been a bit different this year because as the skipper there is a lot more to think about, but I feel I’m starting to get a handle on it. Sport24 asked: How’re you so multi-skilled for such a massive man? Brodie Retallick: Growing up I had an older brother, Brook, who played as a first-five (flyhalf) so he always had the skills and I was just trying to keep up with him. (Retallick stands at 2.04m tall and tips the scales at 123kg). As I have grown as a player, my ball skills are a part of the game that I have enjoyed getting better at. I have definitely worked hard at my passing and offloading as a lock forward, but I guess owing to my athleticism it has coming naturally to me too. Aside from doing my basics well in the scrums and line-outs, running and passing is a part of the game that I enjoy and I just keep working hard at it. We grow up in New Zealand with the mentality of throwing the ball around in the backyard and that later translates to the rugby field. And, in terms of executing our skillset under pressure, we pride ourselves on that potentially being our point of difference. As far as I can see, from our national competition and leading through our Super Rugby franchises to the All Blacks, it’s basically about expressing your skills and that is what makes rugby exciting for us. In terms of individual accolades, winning the 2014 World Rugby Player of the Year award was a pretty proud moment for me. You can't drink out of it (the prize) because it’s just a little plaque, but I put it up on the mantelpiece pretty proudly and was chuffed to receive it. It was nice to win that individual accolade, but it also came off the back of a good team effort. Heading into that year, I remember thinking that I just wanted to improve and I didn't expect it would go as well as it did. As a player, you want to explore different areas of yourself and meet new challenges. It was an honour to be fair. Sport24 asked: How much longer are you set to play for the All Blacks? 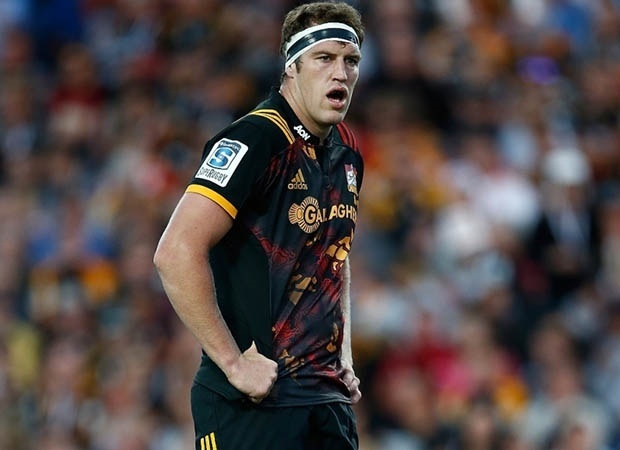 Brodie Retallick: I have been a part of the All Blacks for a while now and it’s been great. It was always a big goal of mine to make the All Blacks and with the World Cup being at the back end of the year in Japan, it’s a pretty big. Playing for the All Blacks is a the back of my mind, but now my focus is on the Chiefs, getting that right and playing well for my Super Rugby franchise. If and when playing for the All Blacks at the World Cup does come along, we’ll sort of worry about all that stuff then. In terms of my post-World Cup future, I’m not too sure yet and I’m still sort of working through that. At the conclusion of the World Cup, I will be 28 years old and I would like to think that I still have something to offer the All Black jersey, but I have to work it (my future) out and see how it looks. (Retallick has been linked with a R17.5m move to Sale Sharks after the World Cup, with the English club willing to make the All Black lock one of the highest-paid players in the game). I know that Kieran Read has announced his decision to play for Toyota Verblitz post-World Cup (having signed a two-year contract with the Japanese club). He has played well over 100 Tests for the All Blacks and anyone that has done that will leave a hole when they exit the team set-up. (Retallick has played 75 Tests for the men in black and has a 92% win rate). Kieran has been around for a long time and is certainly both a great player and leader, so there is definitely going to be a void there. But what New Zealand rugby prides itself on is that when someone steps away, it’s an opportunity for someone else to fill the void and stamp their mark on the black jersey. I’m sure that there are some young boys already wanting to step into the jersey when Kieran and a few others opt to go post-World Cup. Sport24 asked: How would you assess the field ahead of the World Cup? Brodie Retallick: The 2019 Rugby World Cup is wide open. Playing at a global tournament is a different ball game because there is a lot more pressure and the style of rugby is not the same to what we are used to in the Rugby Championship. I think there will be a lot of teams going to Japan with high hopes to come out on top. Any team that wins the Six Nations has to be playing good rugby. I watched Wales beat Ireland and was hugely impressed with the Welsh team. They are working hard and have a great kicking game. You can’t say that Wales aren’t going to be in it from September, along with England and Ireland. I think it’s going to be a very competitive World Cup event and we know what Australia, Argentina and South Africa can produce having played them in the Rugby Championship. And, once we play the other southern hemisphere teams in the Rugby Championship this year, we can see where everyone is at after what the Six Nations teams delivered. Sport24 asked: What worked for the Boks against the All Blacks last year? Brodie Retallick: The Springboks beat the All Blacks in Wellington during last year’s Rugby Championship by turning out with huge physicality, drive and their line-speed on defence. They put us under a lot of pressure and we weren’t finding the holes. It looks like their Super Rugby franchises have taken a bit of that from the Springbok side. However, I think it (line-speed on defence) is something New Zealand has caught up with, and many of our teams across the board are now defending like that. It’s something we have been dealing with during the back end of Super Rugby and then especially at the start of this year, with the way the Crusaders and Hurricanes defend. We are now a little bit more adapted to that tactic and are keen to put our attacking game on the park. Sport24 asked: What is your outlook ahead of your Loftus assignment? Brodie Retallick: We are aware that the Bulls are leading the South African conference and are playing well. They have a big forward pack and, like a typical South African team, they run hard at you and then want to hurt you when you carry the ball. But at the same time, they have exciting backs, so it’s going to be a real challenge for us on Saturday. It has been four or five years since I last played in Pretoria and performing on the Highveld is always an acid test. Running out at Loftus Versfeld, where I have played a few times in the past, is different to the stadiums we normally play in in New Zealand and that is a little bit of a daunting challenge in itself. However, we are excited to go out there again and show what we are about. It’s exciting for New Zealand team to come to South Africa and is something different for us because we only visit once a year. It’s the first time playing in Pretoria for a lot of our boys, so it’s going to be a great experience. We are looking forward to playing some good rugby and will be up to whatever the home team put on the field this Saturday. The Bulls’ style of play may offer some opportunities for us with our exciting back three. And with Damian McKenzie at fullback, he’s dangerous with ball-in-hand when he finds some space. Sport24 asked: Three dream dinner guests. Who would they be and why? Brodie Retallick: I’m a big rock and heavy metal fan and would invite Metallica over for dinner and a yarn. From a sporting front, Michael Jordan and Usain Bolt would also make the guest list. They were the best in the world at their respective sports and, for me, both were once-in-a-lifetime athletes. It would be awesome to meet them and listen to what made them tick. They both came from different backgrounds to achieve global sporting success, and it would be interesting to hear how they did it.